What are your thoughts on this conversation? I believe that is true. I had a discussion with a respected hamster breeder not that long ago about this same thing. I'm actually kinda impressed that browns knows this and explained it very well. 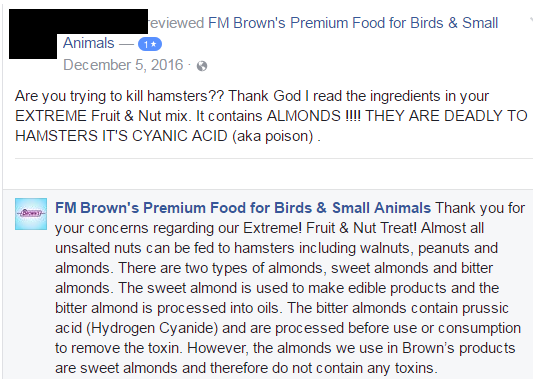 I agree as well and have said before that I was pretty certain people were just confusing sweet almonds and bitter almonds. Same thing happens when people confuse english walnuts and black walnuts. @scaredymouse wrote: I believe that is true. I had a discussion with a respected hamster breeder not that long ago about this same thing. I'm actually kinda impressed that browns knows this and explained it very well. I know, they are a really nice company but they get a lot of hate. Take a look at these other comments.. I have a bag of that "Extreme! fruit & nut mix", but I've just been picking the pumpkin seeds, papaya, sweet potato, and banana out for them to eat... Could they have the almonds too? I was also wondering about the peanuts and pineapple.. Peanuts are an allergy risk but ok as an occasional treat right? And is pineapple ok dried? Peanuts seem to do okay as an occasional treat- they are Hodag's favorite thing on earth so he gets probably entirely too many of them (no troubles so far, knock on wood) and that means Flynn gets an occasional one as well (he loves them but he's got enough probs with his mites so once I found out mice can be allergic I decided he can't have many). He gets plenty of fresh fruits and veg and sometimes millet but I haven't ever given him nuts other than those peanuts... hmm, maybe he'd like them. I should boil an egg so he can have a piece, our girls always liked that in the past. All nuts are safe to eat. The only problem with peanuts is the potential to cause allergy which tends to manifest as a skin reaction. Dried pineapple is probably safe but since its so high in sugar, I would skip it. My thoughts on peanuts is that there are so many other things to give them as treats, why give them peanuts when there's the possibility of allergy? That aside, they are safe to give if you're willing to deal with a potential allergy, which could turn into ocd scratching.